For as long as sports have existed, athletes’ wives have existed. For much of their existence, however, athletes’ wives have remained seen but not heard; mere eye-candy that travels to support their spouses. While the media often got the inside scoop on their famous husbands, most of the public was left wondering what these women were really like and what they did all day. But with the advent of social media and reality television, the athletes’ wives, or as we like to call them GladiatHer® Wives, have increasingly become more vocal, noticeable (and dare I say household names) in society. These outlets and genuine interest in these women have afforded athletes’ wives the ability to form their own brands and streams of income while sharing a piece of their lives with the world. But their sharing has limits, or so society says. While the personal brands they have built for themselves might be their own, those brands are inevitably (and at times inextricably) linked to their husbands’ brands. And existing in that place of representing themselves while simultaneously representing their husbands (and husbands’ bosses) is a tough place for some women. They must balance between speaking their minds and pursuing their dreams while not clashing with their husbands’ careers and industries. Most times, they seem to nail the balancing act with extreme precision. They craft and monitor their public images so as not to ruffle many feathers but still keep people interested. But there are noticeable times when they seem to “miss the mark” and all hell breaks loose on their entire existence. Take for instance Kaela Carpenter, wife of Buffalo Bills kicker, Dan Carpenter. Last week Kaela let her Twitter fingers do the talking when she saw something she didn’t like during her husband’s football game. In attempt to block a field goal, Seattle Seahawks cornerback, Richard Sherman, collided with Dan. 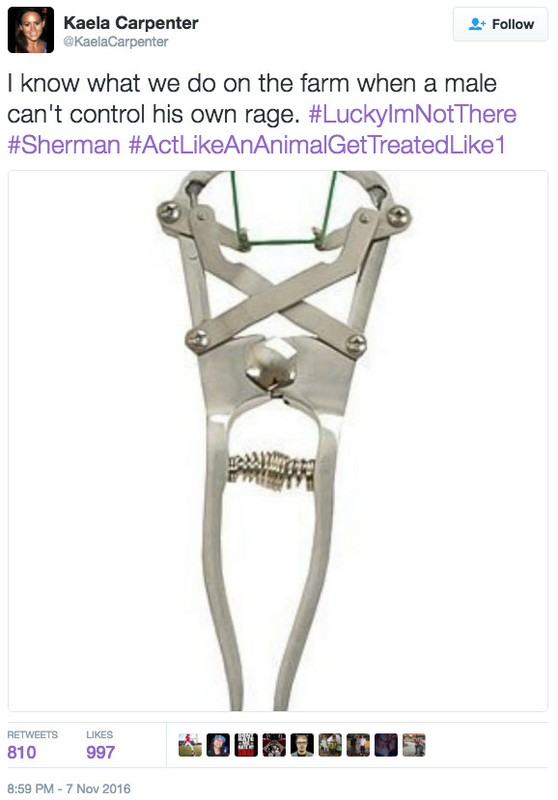 In apparent defense of her husband, and perhaps whiteness, Kaela suggested that Sherman (a black man) should be castrated for touching her husband (a white man)…in a contact sport. As to be expected (and probably rightfully so), many, MANY people found issue with Kaela’s choice of words. But what some also found issue with was the fact that she had said anything at all; that she had dared to comment on a man’s game. Many suggested that, as an athlete’s wife a woman, her role was to sit quietly and look pretty. Kaela isn’t the first or last wife that’s been told to know her place. Remember last summer when Stephen A. Smith felt the need to school Ayesha (wife of Stephen) Curry on how she should act? Rather than stop at telling her to be quiet and know her place, he was so gracious has to give her an example of the model athlete’s wife, Savannah James. And on a fairly regular basis, the very vocal Miko Grimes who talks about everything from the NFL’s practices to her husband’s former quarterback to Sage Steele, is told to shut up because she’s out of line. In a time when America elected a man who bragged about grabbing women by the p*ssy, I think I need to remind people that women can say whatever the hell (excuse my French) we want. Period. Women don’t have a place to stay in and our mouths don’t need to be shut, no matter what our husbands do. We own our mouths, our Twitter fingers and our p*ssies. It’s really not that complicated. Now that’s not to say that we shouldn’t suffer the consequences if we say something offensive or counterproductive, but muzzling a woman because she’s married to an athlete just isn’t going to fly. We live in a society were women are underpaid, objectified and at times flat out ignored. So the notion that what an athlete’s wife says could somehow tarnish her husband’s career or a league’s brand is far-fetched at best. But if that is somehow the case, that’s for her, her husband and the whoever they worship to handle, not Stephen A. or some random guy on Twitter.